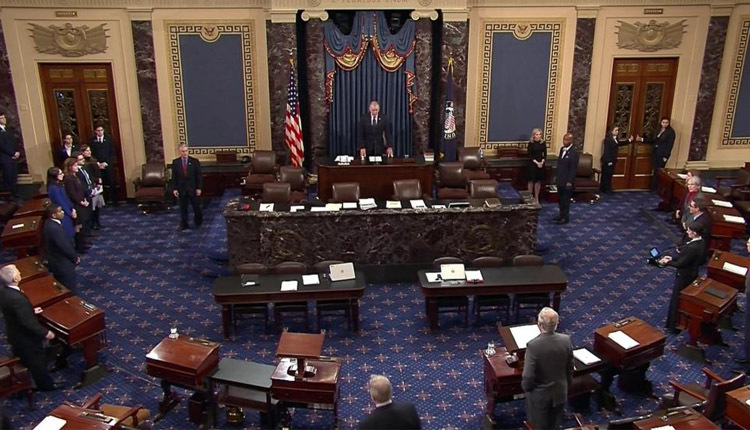 In a rare break with President Donald Trump, the Senate voted on Wednesday to move ahead with a resolution to end U.S. military support for the Saudi Arabian-led coalition in the war in Yemen and lawmakers vowed to push for sanctions against the kingdom in the new year. Eleven of Trump’s fellow Republicans joined Democrats to provide the 60 votes needed to advance the war powers resolution in the Republican-led chamber. The vote paved the way for debate and a vote on U.S. involvement in a conflict that has led to the deaths of tens of thousands of civilians, many of them young children and left millions more at risk of starvation and death by disease. The nearly unprecedented break the 11 Republicans made from Trump was largely symbolic because the House of Representatives is not expected to take the matter up this year. Trump has threatened a veto. But backers of the resolution said it sent an important message that lawmakers are unhappy with the humanitarian disaster in Yemen, and angry about the lack of a strong U.S. response to the killing of journalist Jamal Khashoggi at a Saudi consulate in Turkey. Republican and Democratic lawmakers also vowed to keep pushing after the new Congress take office in January for further tough action against Saudi Arabia, including legislation to impose human rights sanctions and opposition to weapons sales. “If you want to buy our weapons, there are certain things you have to accept. How you use them matters,” Republican Senator Lindsey Graham told a news conference. “The individual, the crown prince, is so toxic, so tainted, so flawed, that I can’t ever see myself doing business with Saudi Arabia unless there’s a change there,” said Graham, generally a close Trump ally in the Senate. Republicans will hold a slightly larger majority in the new Senate, but Democrats will take control of the House of Representatives, increasing the chances of sanctions legislation passing. The Trump administration had urged Congress not to oppose U.S. fueling, targeting help and other support for the Saudi-led coalition as it battles the Houthis, Shi’ite Muslim fighters viewed by Yemen’s neighbors as agents of Iran. Earlier on Wednesday, Secretary of State Mike Pompeo defended the administration’s handling of Khashoggi’s killing. Pompeo repeated his assertion there was no direct evidence linking Crown Prince Mohammed bin Salman to the Oct. 2 killing of Khashoggi in Istanbul, despite a CIA assessment it was likely he ordered the killing. Trump condemned the murder but has stood by the Saudi crown prince. “He’s the leader of Saudi Arabia. They’ve been a very good ally,” Trump told Reuters on Tuesday in an Oval Office interview. Central Intelligence Agency Director Gina Haspel briefed leaders of the House of Representatives behind closed doors about the killing. After the classified meeting, House members said they had not heard anything to change their minds about Khashoggi’s death. Democratic Representative Eliot Engel, likely the next chairman of the Foreign Affairs Committee when Democrats take control of the House in January, said he intended to hold hearings starting early next year on all aspects of Saudi behavior and the U.S.-Saudi relationship. “Saudi Arabia’s an important … partner, but I don’t think we can simply look the other way when things happen and talk about business as usual,” Engel said. Pompeo and Defense Secretary Jim Mattis, who held a separate briefing for the entire Senate, are due to discuss Saudi Arabia with the entire House on Thursday. But several lawmakers have urged that Congress keep the Yemen conflict separate from anger over the killing of Khashoggi, a U.S. resident and Washington Post columnist. They view Saudi Arabia as an essential counterweight in the Middle East to Iran, arch-enemy of close U.S. ally Israel. White House officials see Saudi support as a linchpin for an Israeli-Palestinian peace plan yet to be unveiled by the Trump administration. Israeli Prime Minister Benjamin Netanyahu told reporters on Wednesday in Jerusalem that Saudi Arabia’s role in the Middle East must be taken into account in responding to Khashoggi’s “horrific” fate. “If Saudi Arabia were to be destabilized, the world would be destabilized,” Netanyahu told foreign reporters, speaking in English.